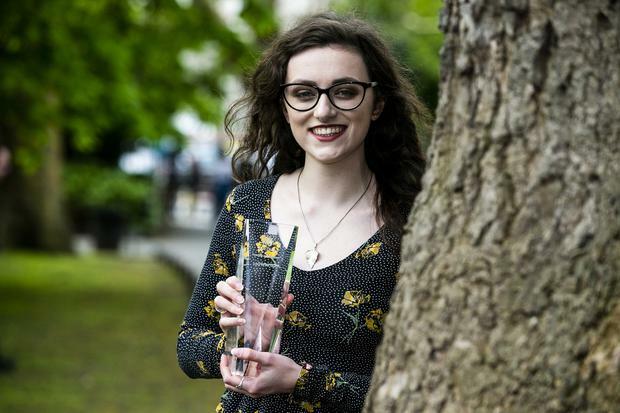 Galway student Aine Kenny took home the Irish Independent’s highly competitive Editor of the Year award at this year’s National Student Media Awards. The 21-year-old journalist from NUIG is the editor of ‘Sin’ newspaper, which is the university’s only college publication. Competing against universities throughout the country, Ms Kenny was lost for words as she was presented with her award by Des Gibson, Tabloid Platform Editor of INM. Hosted by Oxygen.ie, the Smedias give students a chance to showcase their work on a national stage. There are 34 categories in the Smedias, and each is shortlisted and then judged by industry professionals, including Irish Independent Editor Fionnán Sheahan. This year’s awards were entered by students from 22 colleges. The colleges with the most wins were DCU and UCD, both with five. There was also an increase in entrants and wins from smaller institutions, including Stillorgan College of Further Education, Ballyfermot College of Further Education, and Coláiste Stiofáin Naofa. “We’re absolutely delighted with both the number and calibre of entries this year,” said Ciara Mahon, from Oxygen.ie. Meanwhile, RTÉ broadcaster Miriam O’Callaghan yesterday told the Journalism and Democracy under Siege conference at University of Limerick there are reasons to be optimistic about the future of the industry. The conference was also attended by INM Group Political Editor Kevin Doyle and Independent.ie News Editor Denise Calnan.